Marty Boldenow is, in 2008, a criminal based in Liberty City who is wanted by the Liberty City Police Department for gang related violence. He can be killed by Niko Bellic as part of the Most Wanted side missions. 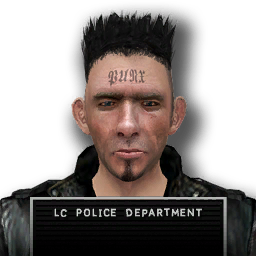 He has the letters BUNX tattooed on his forehead. This page was last modified on 26 October 2013, at 13:50.